Arabian Horse Association Legion of Supreme Honor Champion; 3 Arabian Horse Association Region 9 Reserve Championships and 13 Top Fives; competed in dressage, sport horse, hunter pleasure, halter, and western pleasure. 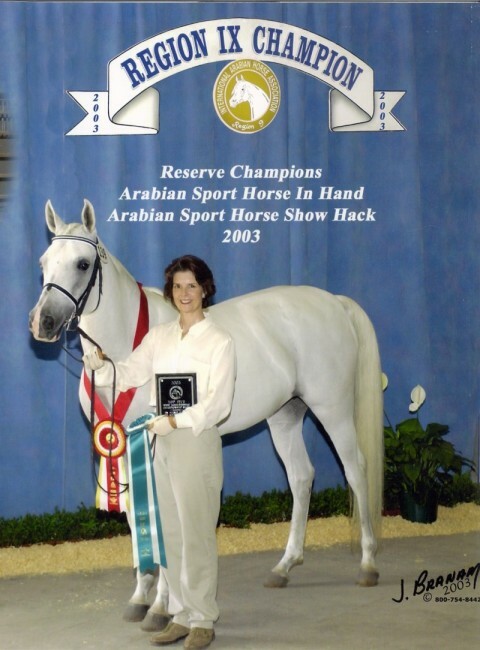 Contessa retired from showing in 2005 and with her friend Mara they were the guests of honor at a retirement dinner party at home, also celebrating their Legion of Supreme Honor Champion awards. Contessa foundered in both front feet in summer 2005 and resumed a comfortable and well deserved retired life after careful treatment and therapy. Upon entering the barn to feed in the morning, we love hearing her soft greeting and seeing her lovely face over the stall door. Contessa is 22 and looks to be a considerably younger lady.